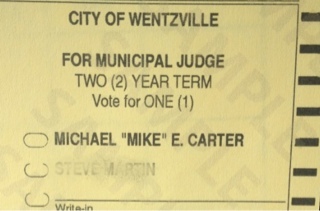 Michael "Mike" E. Carter was the first to declare candidacy for Wentzville's municipal judge. Carter only said of his opponent that he hopes Mr. Martin is "re-thinking his campaigning approach of 2011. I (carter) never bought into Martin 's type of negative campaigning, but, such is local politics I guess." 3) Carter wants to get every Wentzville voter a copy of the U.S. Constitution. It is the foundation of every court room.